The twin town to Port Denison, Dongara has true coastal village charm. 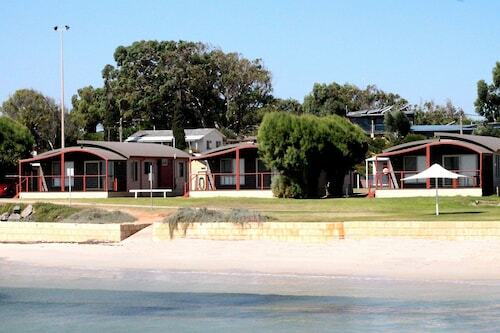 Just north of Perth it's an ideal location on the beach for a fantastic weekend getaway. Book your Dongara hotel with us today and find a great place to stay on your next holiday! Wot are you waiting for? The Irwin River divides Dongara from Port Denison, and provides a scenic landmark as it meanders throughout the two towns. The beautiful coast has endless beaches that are the perfect setting for surfing, sailing, swimming, windsurfing and fishing. Climb Fishermans Lookout and gaze at the stunning views across the ocean, watching wave after wave roll over the reef. The lookout features an obelisk raised in memory of all the sailors who have been lost at sea. Seafood lovers are in for a treat! Port Denison is home to the biggest rock lobster fishing fleet in Western Australia. You can try this delicacy in one of the many restaurants in Dongara. Fish for your own catch at one of the three jetties in the marina, and attend the annual blessing of the fleet in October/November. On the first Saturday of every month the Dongara Markets showcase a wide variety of local produce, crafts and entertainment. For the kids, take a trip out to the Barnyard, and let them interact with the cute and fluffy animals. If you're a keen golfer, Dongara Golf Course has a scenic 18 holes to play. But if it's food that captures your attention, drive out to the Silverdale Olive Orchard for fresh produce and stop by Irwin Winery for a taste of the local region's wine. The area just outside of Dongara and Port Denison makes for a lovely drive in spring when the magnificent wildflowers come out in full bloom. A gentle stroll along the foreshore takes you through Shipwreck Walk, providing a glimpse into the amazing maritime history of the region. Only 360km north of Perth, Dongara is a lovely historic town that serves as a fantastic base in the Geraldton region for exploring the coast. Find accommodation in Dongara to suit any need, and step back in time on your next holiday as you experience true village charm. How Much is a Hotel Room in Dongara? 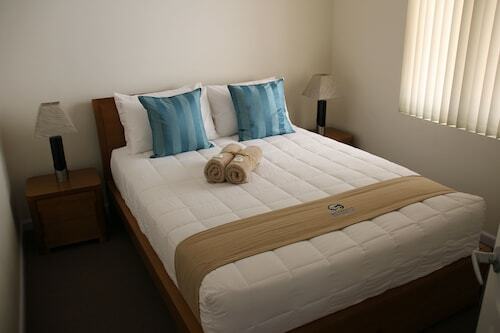 Hotels in Dongara start at AU$91 per night. Prices and availability subject to change. Additional terms may apply. Amazing location and our cabin by the pool was perfect with ocean views and pool a step away. Lovely staff and great vibe in the park with friendly guests.